Robots vs. clowns on pigs??? Check out this awesome poster the boingboing gadget blog put on display. 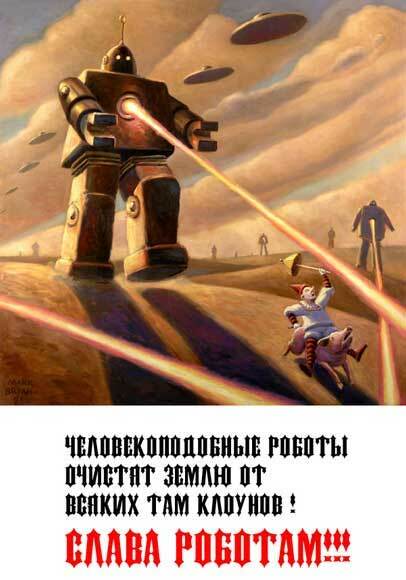 No idea what the text says, but clearly it is further evidence of the coming robot uprising. Note that the image creator must have been coulrophobic – a clown on a pig getting shot at by a robot with a energy-cannon for a belly-button. That, dear folks, is what is called “pure win” by gamers on t3h intarpip3s. Author ragmanxPosted on September 1, 2007 September 1, 2007 Categories Random Ramblings, Useless knowledge, WTF?